How quickly Chooseday comes around each week! This week I’m talking about the importance of being definite about your goals. This is the first of six steps I talked about last week, taken from Napoleon Hill’s Think and Grow Rich. He has spoken about being definite about the amount of money you desire. It’s equally applicable for other things. If you wish to become more healthy, what exact statement will tell you have achieve this? It’s not enough to say “I wish to lose weight” as there are a number of ways this could be achieved. You could get really ill and become frail and lose half your body weight, but this isn’t necessarily what you had in mind. Better to focus on “I’m so happy and grateful now that I can walk up 4 flights of stairs easily and effortlessly” or “I’m so happy and grateful now that I have a toned tummy and look great on the beach”! If you have all the money you need or want, then decide what else you would like. Would you like more time to spend with family or for travelling? By the way, money beliefs can also play havoc with our goal setting and achieving. If it feels wrong or upsetting to you to set a larger financial goal than ever before, you could have judgement about riches or making lots of money. It’s a good idea to spend some time with a good business or life coach to decide if this is in line with your personal values or whether it’s involving beliefs and paradigms that you want to change. There is a universal law of order, which is important to understand. There is first order, then movement. By being definite, we create a sense of order first in our own mind, then to everyone around us. Think of a GPS. You put the destination into your GPS (or google maps!) and you get directions that take you from where you are to where you want to be. Our mind is like our own personal GPS. The only problem is that it’s often set on past destinations or destinations that we don’t even like. Then we wonder why we keep on ending up there! Being definite about our next destination in life is vitally important. In all areas, from career to relationships. From health to a healthy financial situation. From fun to friendships. Decide exactly what you really, really want. Allow yourself to be generous with yourself and what you want. Then think of other ways as to how what you want could also help others. If your cup is empty, you can’t give anything to anyone else! If your wallet is empty, you can’t help anyone with money. If you have run yourself down and have no energy, how do you give of your time to others? That’s a whole other topic which I will cover in my future Chooseday messages! Don’t set resolutions. Write down your dreams and then commit to doing whatever it takes to move you one step closer to them. Resolutions are like to-do lists. The sort of things we feel we should be doing. There is no inspiration in resolutions. They simply keep us being busy, instead of making space to achieve the things that are REALLY important to us. It’s way better to get clear on what you really, really want and what is important to you – and then go from there. In my mind here are some resolutions: Lose weight, be more disciplined, spend more time exercising, keep the house tidy, blah blah blah! Do you feel like jumping up and doing anything after reading these resolutions? Of course not! How do you feel about these statements? I certainly feel a lot more inspired and if you don’t it’s probably because these aren’t goals that inspire you. Find statements that inspire and excite you. Lose weight (haven’t we tried writing this before? What results did you get?) – when you tell your body that you want to lose weight, it simply hears that something has been lost and will help you find it. Something like “oh dear, Jill’s lost some weight, lets’ help her find it and make sure it stays on for good so she doesn’t lose it again”. Yay, that’s really going to work! Be more disciplined: Yawn. Have you ever spent time in someone’s presence that is very very discliplined? Painfully so! There is no excitement in discipline for discipline’s sake. There is excitement in the results you get. Just like people don’t buy a drill because they want to display a drill in their shed, they buy it so they can make holes with it. Wonder why my husband keeps his hidden? Think about what you would like discipline for, and then ask if discipline is really what is required. Sometimes it is, sometimes it isn’t. Spend more time exercising: Now this has a bit more merit than the first two, but I’d suggest you amp it up a bit. If you love tennis, then decide to play tennis with friends every week or fortnight. If you enjoy the sea, then decide you’ll treat yourself to a swim every morning before anyone else gets up. Make it sound fun, not like a chore. None of us like chores, least of all the child inside of each of us! Keep the house tidy. Mmm – this is a contentious one. Again, is it the tidyness you seek or is it the desire to be able to find everything when you’re looking for it? Is it being able to entertain family and friends at home and not have everything falling out the linen cupboard as they walk down the passage? What’s the important part of this that will make you want to hop up and do a spring clean? Or even better, hire cleaners to do it for you so you can focus on running your business or get time out with that exercise! This means that you’ve written a book (might want to get writing straight away so it’s ready for release at the end of 2013 – yes, you can do this one even if you’ve never written a book and haven’t started yet). It means that it’s well received – in order to make the bestseller list – so it’s a success. If you don’t care about bestseller status, then change it to “I’m standing at my book launch and love the feedback I’m getting from 100 of the readers”. Make sure it’s personal to you and what presses your buttons. It may also mean a bit of travel if you want to get it into other countries. Writing I’m so Happy and Grateful at the beginning of each of your statements also implies that you are happy and grateful. Getting into a positive state is critical to achieving your goals. 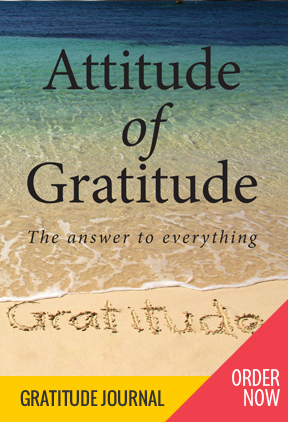 This is why I’ve written the Attitude of Gratitude Journal. “I’m so happy and grateful now that I can run effortlessly along Trigg beach in my bikini” (Think Baywatch). This one covers so many things – running effortlessly means that you’re in peak health. Those knees no longer creak and give you pain, you can breathe while running (always a good start if you want to stay alive! ), your back is healthy. To run truly effortlessly I think you’d need to be close to your perfect weight for your body. Running along in a bikini effortlessly would indicate that the bikini actually looks good (or that’s what I’m thinking) – otherwise why would you be doing it? If this is a statement that excites you, then it’s easier to eat really healthy, get lots of exercise and nurture your body so you can do this. This also encompasses many things. Firstly that you’ve got to 20 years of marriage without succumbing to the divorce statistics, secondly that you have the financial resources to travel to the French Polynesian islands to get to Bora Bora, thirdly that you have the time to go there and spend a few days there. This would imply that income is good enough to get this goal. What actions would you take? Spend time deciding how to get the money for the trip; or get that body into shape in time; or get a passport before your current one expires. Book someone to come and look after the kids while you go away; Create the lifestyle you want that allows you to take a week or two to go to places like this. Do you see what I mean? There is a big difference between resolutions and desires. Pick the ones that are going to help you take positive action in the right direction NOT the ones that just make you feel like a failure. Look back on everything you’ve succeeded with – I’ll bet they were things you were excited about. Make 2013 your best year yet!